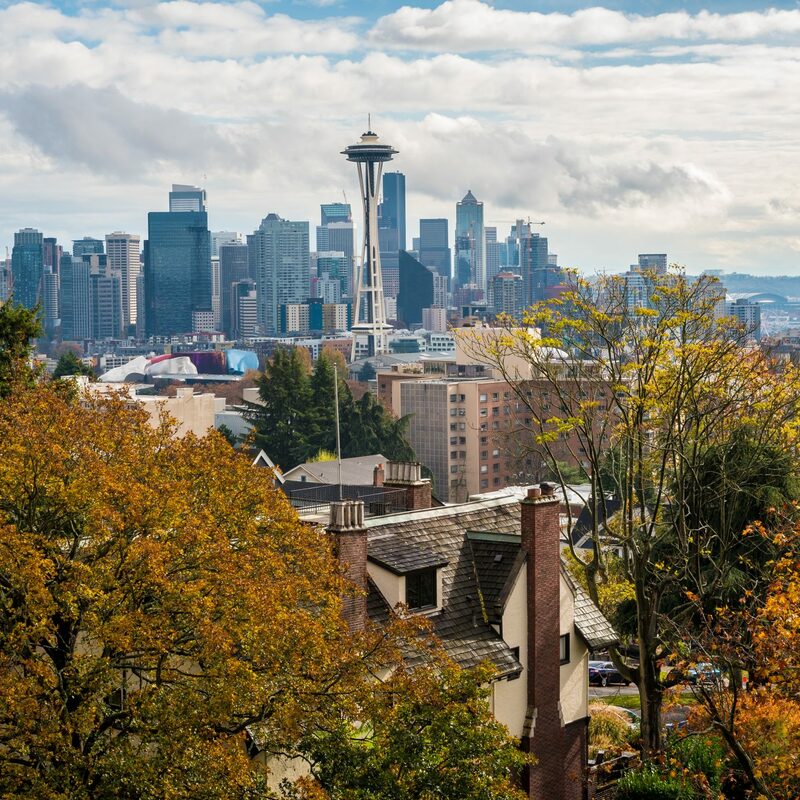 What do you get when you combine a city world-famous for its frenetic nightlife and unrestrained glitz with a strip of massive casino resorts all trying to outdo each other? 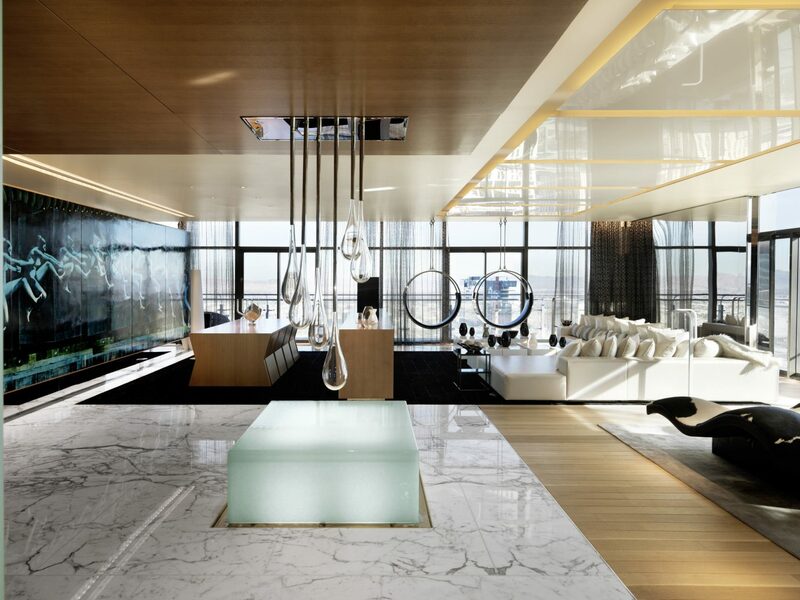 Penthouse suites and villas as gaudy and gorgeous as the city they lord over, with the kind of next-level extras designed to make your jaw drop. 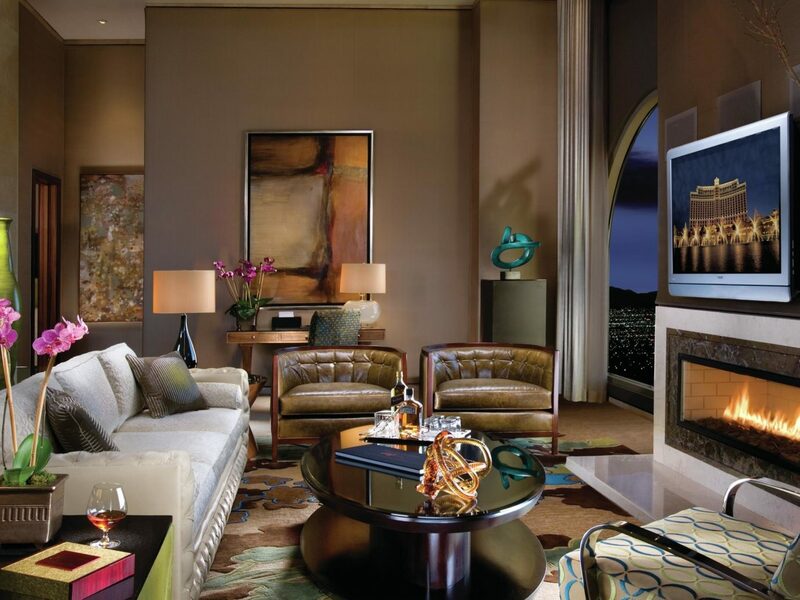 Do the most expensive hotel suites in Vegas live up to their price tag? We'll let you be the judge. If it's good enough for the likes of Jennifer Lopez, Miley Cyrus, and Justin Bieber, then it must be worth the splurge, right? We'll let you decide: The Nobu's crown jewel, the David Rockwell-designed Nobu Villa, clocks in at a whopping 10,500 square feet of unrestrained extravagance. 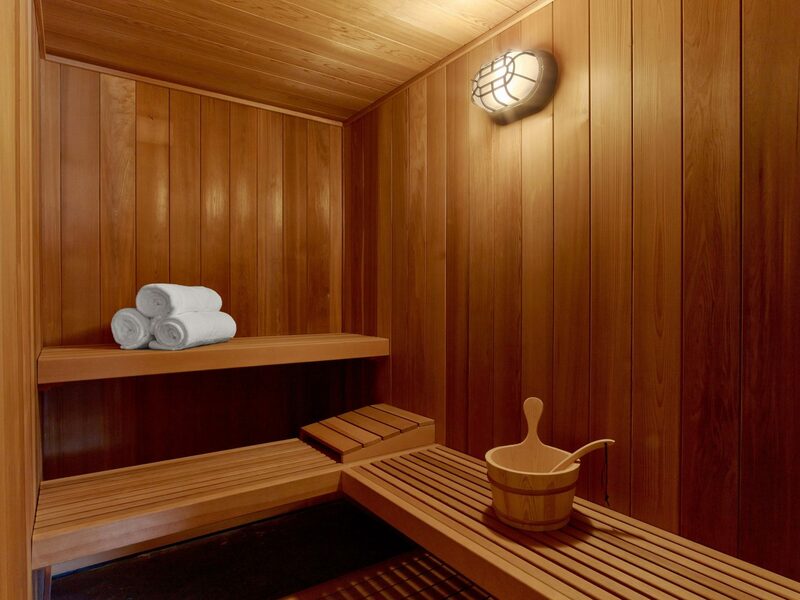 The $35,000-a-night bill pays for three bedrooms including a master suite with its own private deck featuring a Japanese maple tree and an onsen, a sauna and massage room, a massive terrace with its own bar, a Zen garden, and multiple dining areas including a sushi bar lined with stools and an outdoor kitchen (you're staying at a Nobu, after all) that looks out over the Strip. 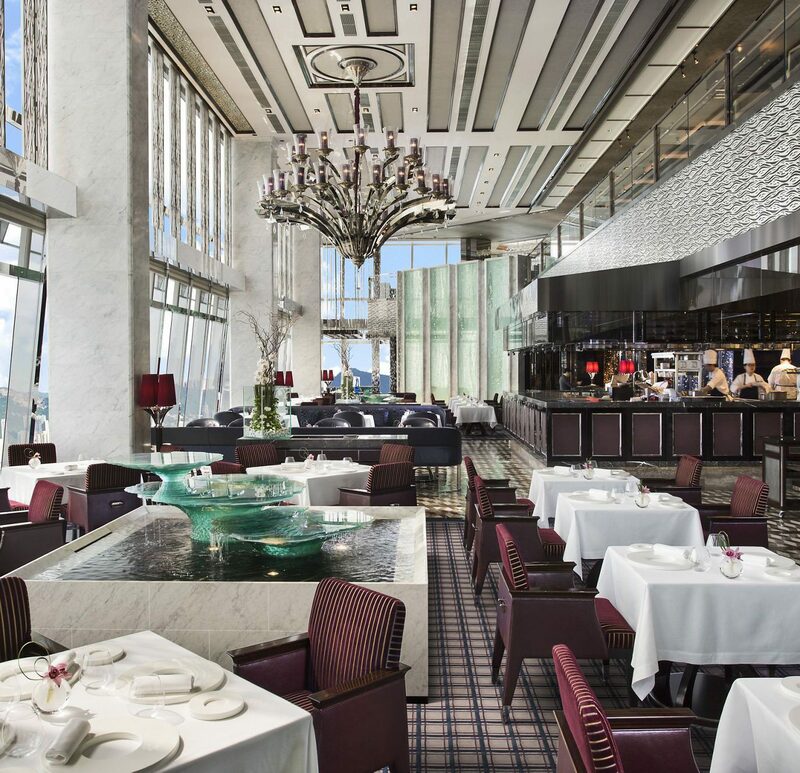 A personal butler is included to make your stay seamless, but around-the-clock room service from the Nobu restaurant downstairs—if you can believe it—costs extra. Throwing the bachelor(ette) party of the millennium? 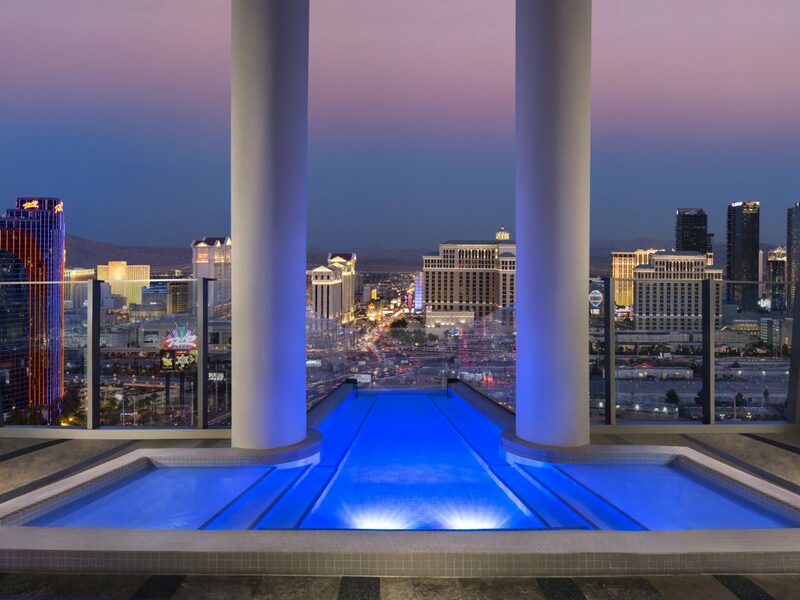 For you and your 11 closest friends, a two-story, 9,000-square-foot Sky Villa at the Palms Casino Resort is the party pad of your wildest dreams. 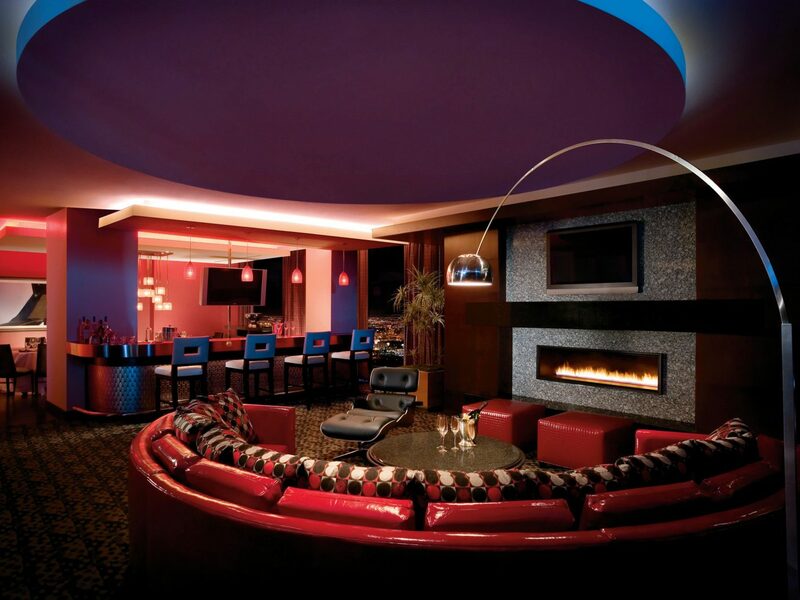 It starts off with a private airport transfer before a VIP check-in right in your own double-height parlor. 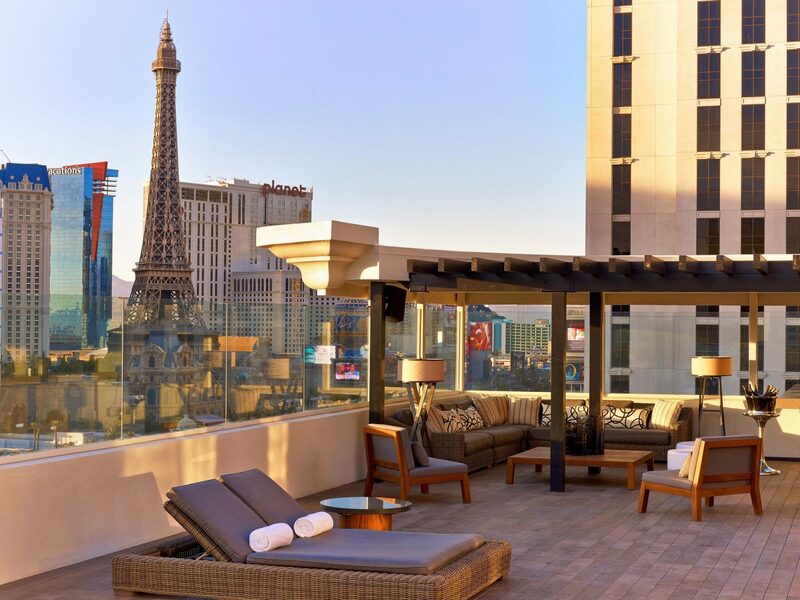 While the Palms is not actually on the Strip (it's about a mile and a half away), you might never even make it out the door—and it might be for the best. There’s more here to entertain than one night can allow: a cantilevered pool extends over the building’s edge, there are massage and fitness rooms and a dry sauna for anyone looking to tone up before a night on the town (don’t let those daily VIP All-Access nightclub passes go to waste), and an in-suite glass elevator makes it so you never have to take your eyes off what you just paid $35,000 a night to enjoy. 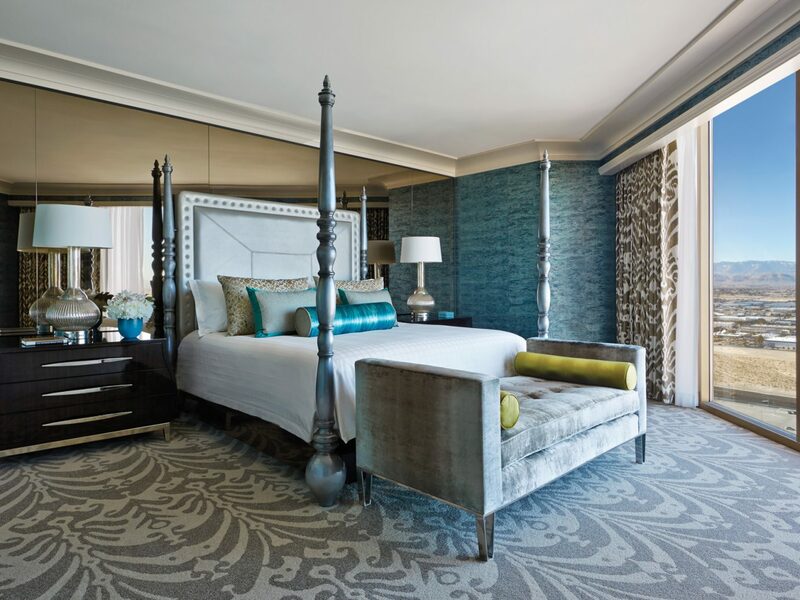 The Cosmopolitan is well-known for its edgy marketing campaign and hip young vibes, but the hotel's four elite 70th-floor suites, designed by Bentel & Bentel Architects, are as austere as they come—a swift departure from the Jonathan Adler-like colors of its lower-tier guest rooms. That's not to say you won't be absolutely floored. Our two favorites include The Foxglove—inspired by classic black-and-white movies like Jean-Luc Goudard’s A Place in the Sun, it features lighting meant to evoke spotlights and moving filmstrips, a bathroom projector that screens films while you soak, and hanging images of Elizabeth Taylor and Montgomery Clift—and The Hemlock, whose design borrows from the mid-century modern estates of Palm Springs and includes extras like a sit-down theater and an indoor hammock made of wolf hide. 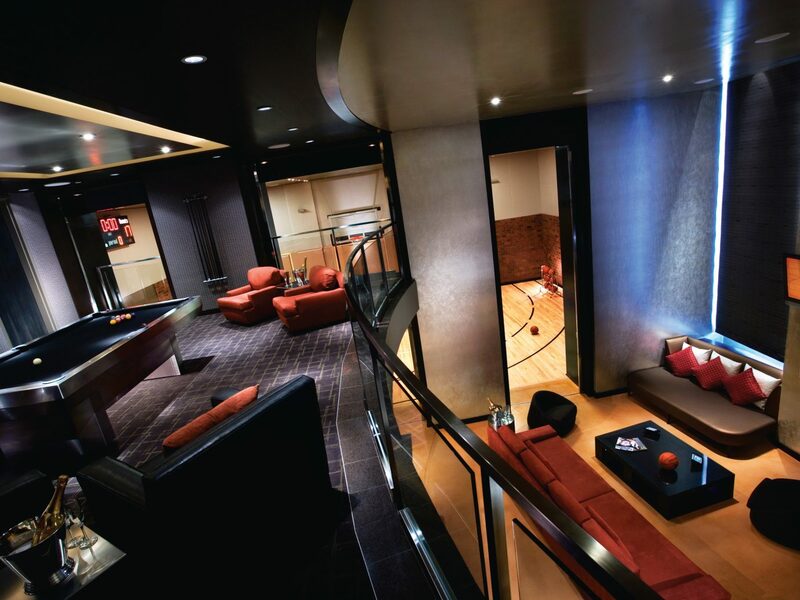 Want to live like basketball royalty? 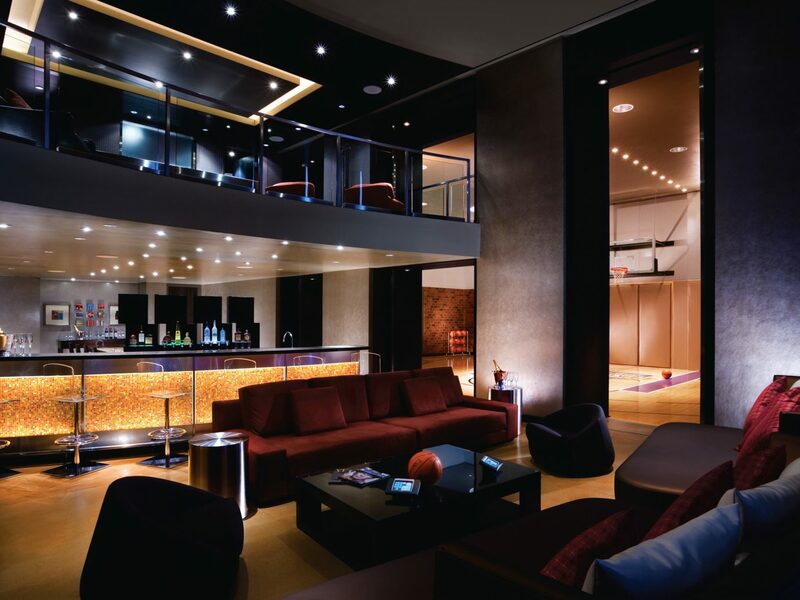 The 10,000-square-foot Hardwood Suite at the Palms invites you to break out your best athleisure outfits and party with aspiring Lebrons (or Lebron himself). 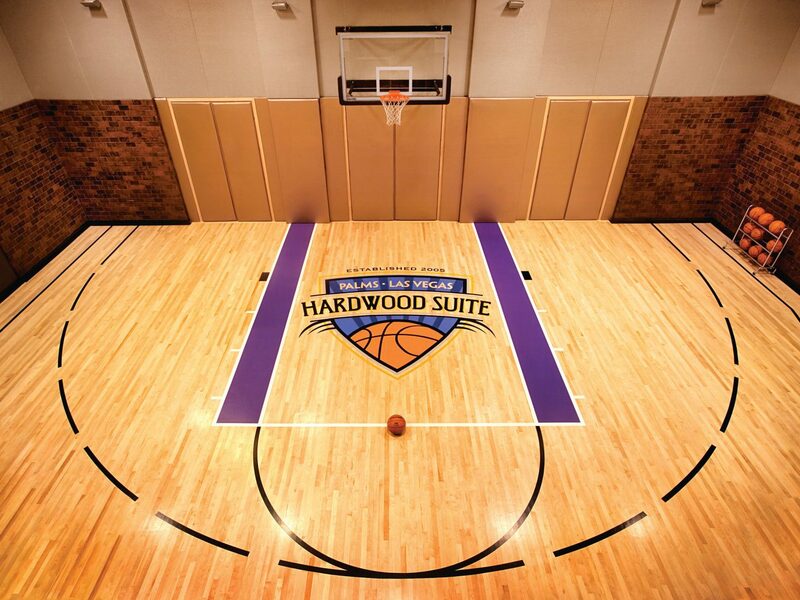 Along with two master bedrooms, the two-floor suite has its own locker room and indoor basketball court (yes, there’s a scoreboard), where three NBA-sized Murphy Beds fold out for court-side zzz’s. 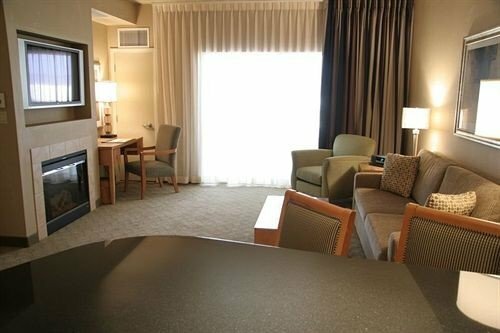 After shooting some hoops, recharge in the Jacuzzi, kick back and watch a game on one of the plasma TVs, or shoot some pool at your billiards table. Want a snack during halftime or a car to the Cirque du Soleil show? 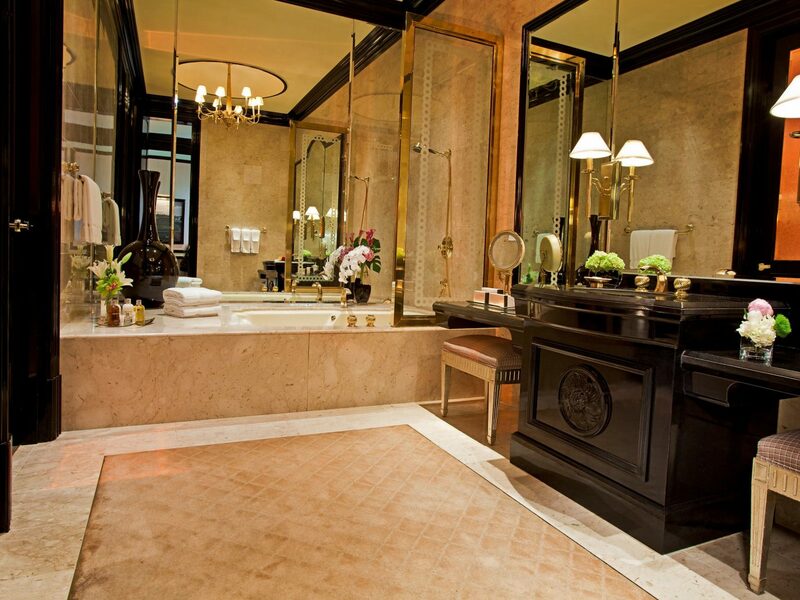 24-hour butler service ensures you never have to lift a finger. 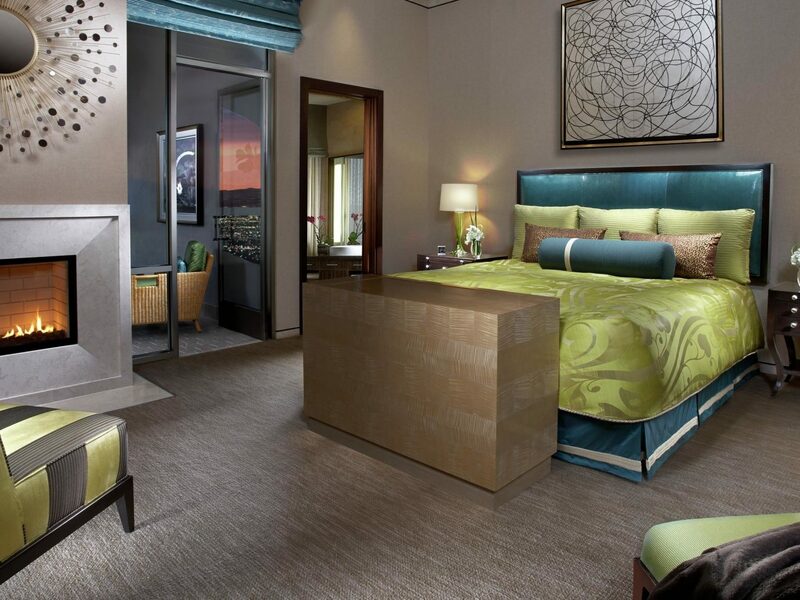 For a hotel as iconic as the Bellagio, with its looming palatial façade and dancing fountains, we'd expect nothing less than high-roller guest rooms that live up to its name. 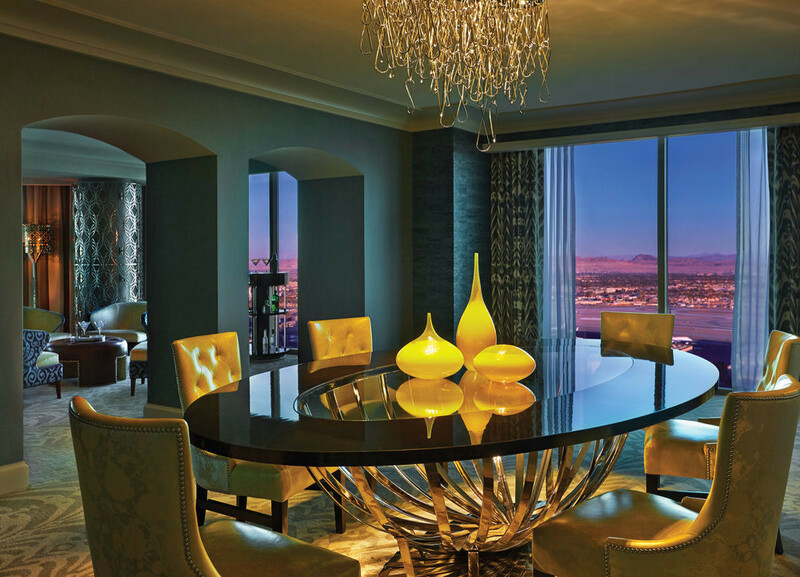 The 4,075-square-foot, two-bedroom Chairman Suite, which sits at the top of the Spa Tower, delivers. Expect your own fireplace, solarium, indoor garden (with a fountain all its own), and L-shaped bar for entertaining groups up to six. 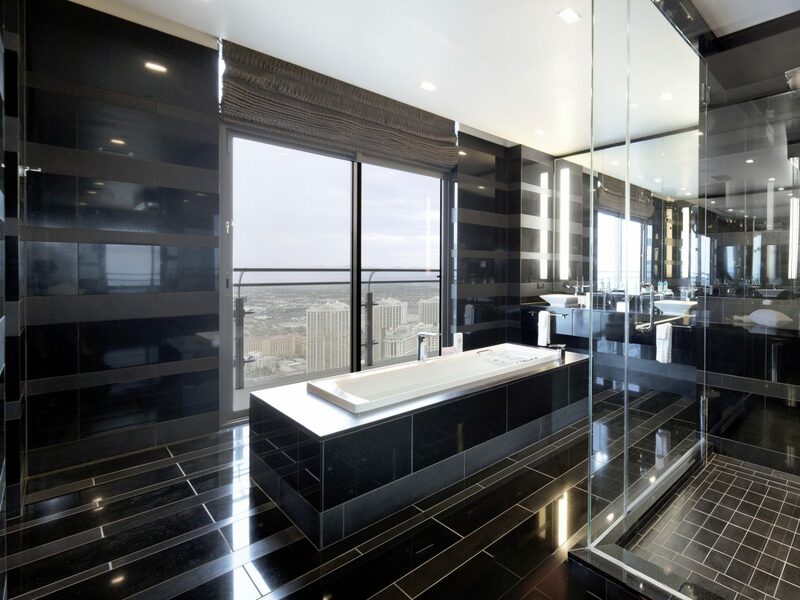 The best way to pass the time, however, might be to simply escape the world during a soak in your bathroom's whirlpool tub, which looks out over the sleepless cityscape. 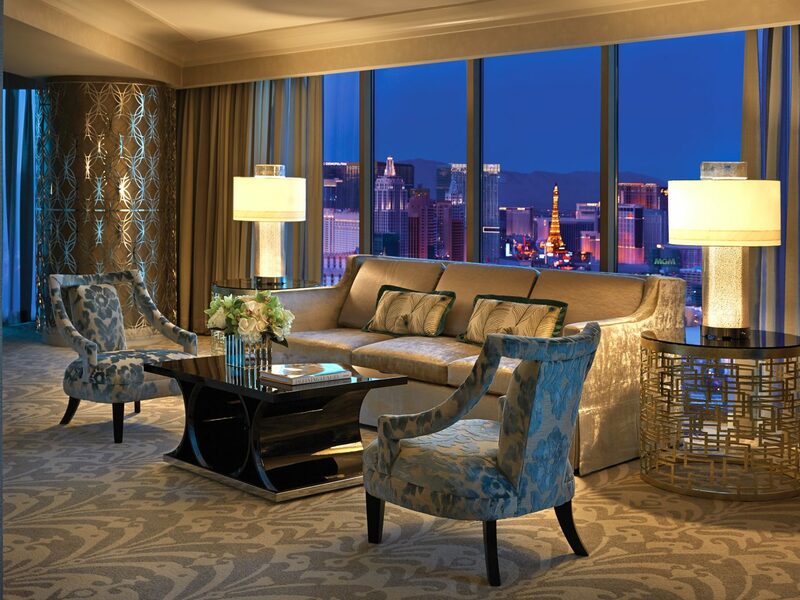 The Mandarin Oriental, Las Vegas has not one but three top-tier rooms on its upper levels, but the 22nd floor's Mandarin Suite might be our favorite. 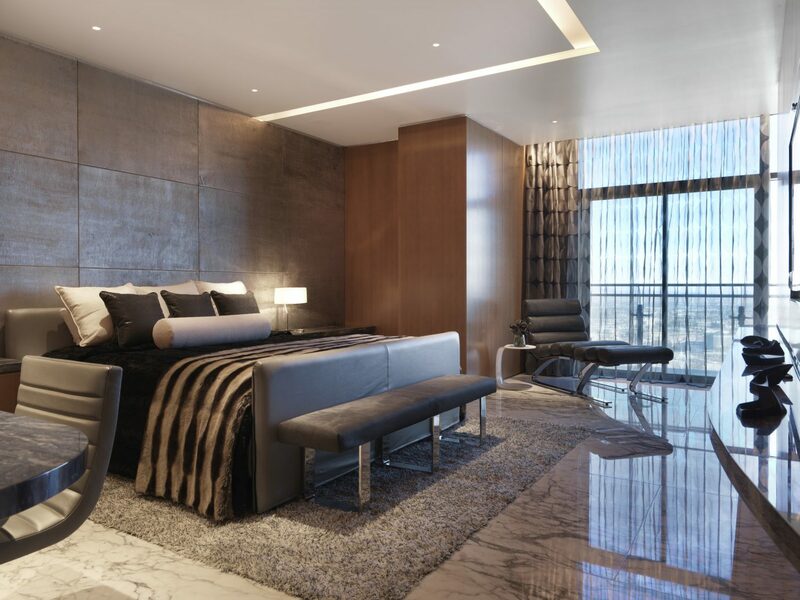 Sure, they all come with incredible living spaces including dining tables for eight, a fitness room, lounges with their own cocktail bars, and Art Deco bedrooms awash in dark woods and patterned rugs. 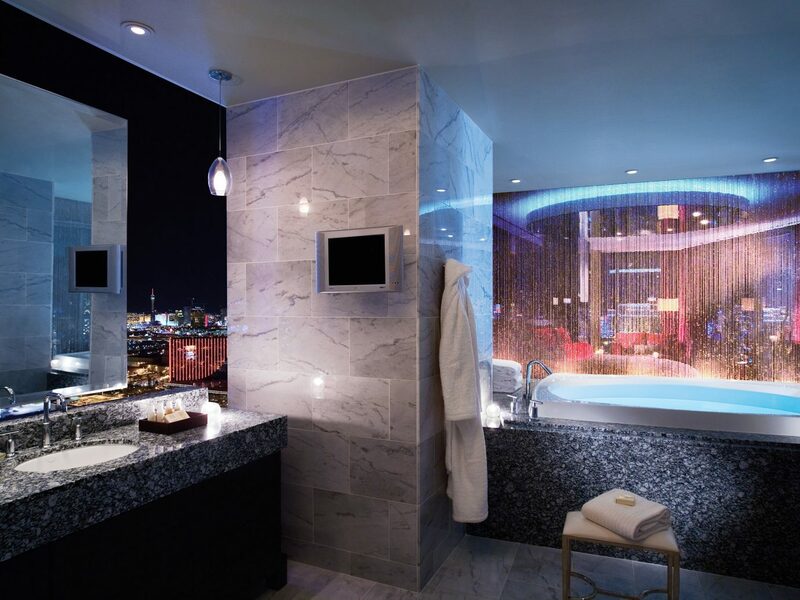 But it's the Mandarin's exclusive feature—a massive bathroom whose oversize sunken bath looks out over the Strip—that truly sets it apart. 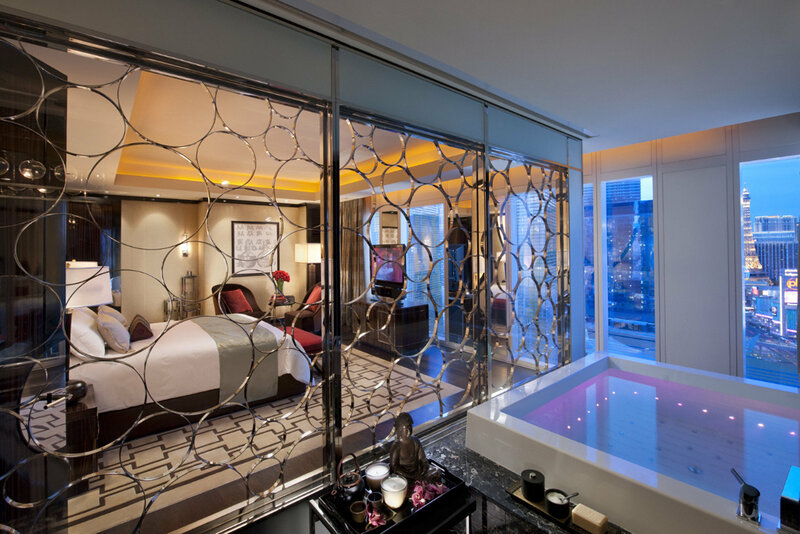 If you can tear yourself away from the view, free usage of the Tian Quan Thermal and Water Experience awaits Suite guests in the spa. After a long night hitting the tables, recharge over breakfast (included in the rate) at MOzen Bistro. 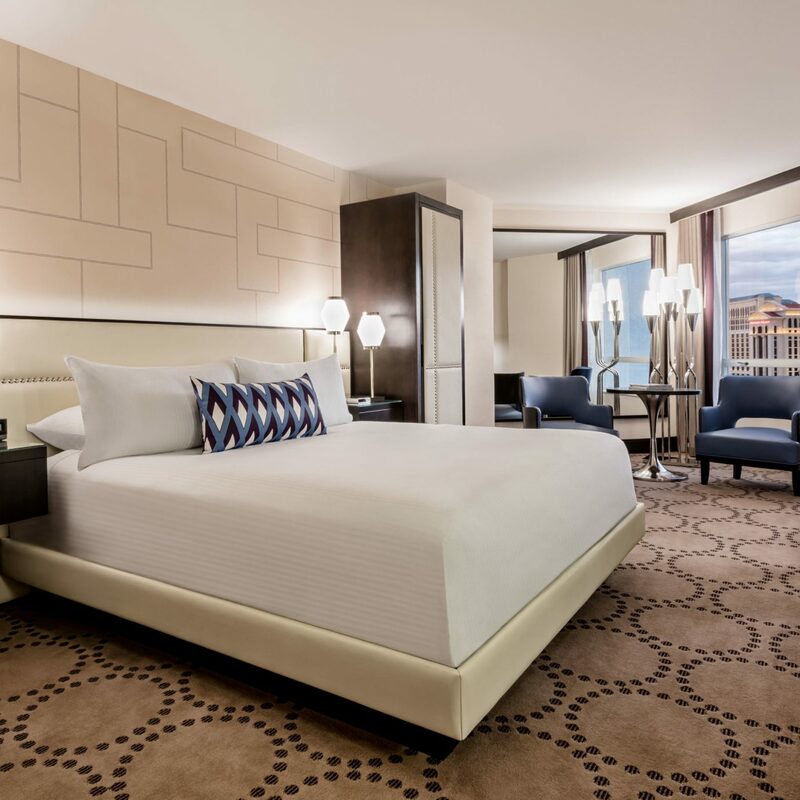 What better way to kickstart—and cap off—a night in Sin City than with your own floor-to-ceiling, panoramic view of the Strip? 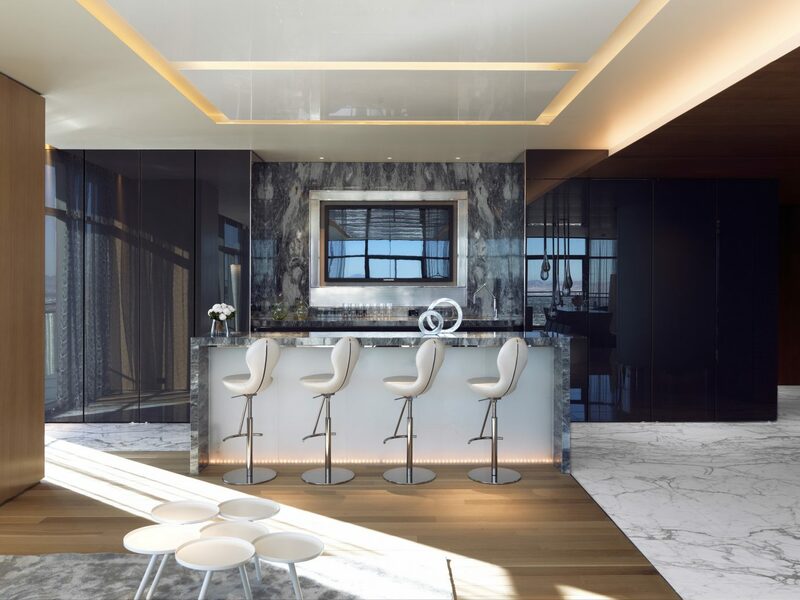 For just $3,000 a night, the Four Seasons' 2,225-square-foot Strip-View Suite can be yours, complete with a dining room, living room, pantry, home office, and master bedroom whose walk-in closet is the stuff of Jetsetter dreams. The windows are curved in such a way that you can watch both the sunrise and the sunset from the comfort of your own bed. 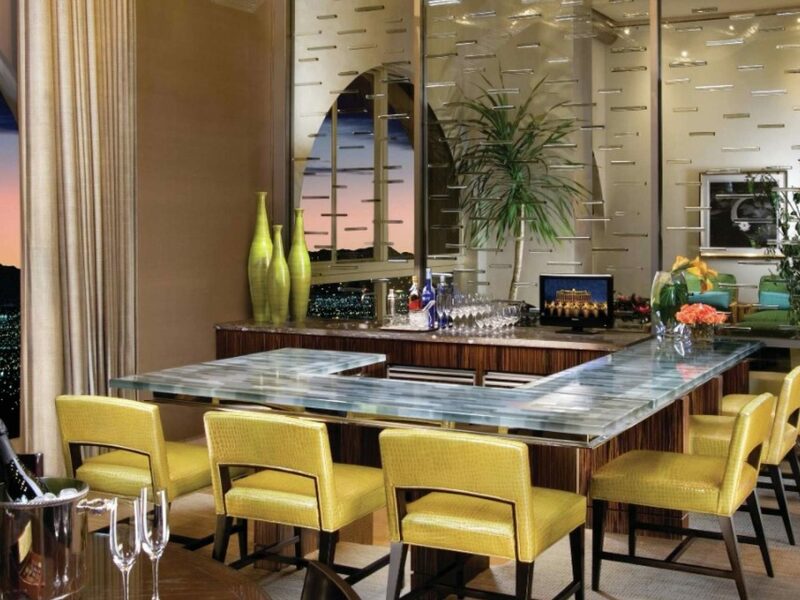 We suggest starting things off with a cocktail from the bar while the staff unpacks your bags. 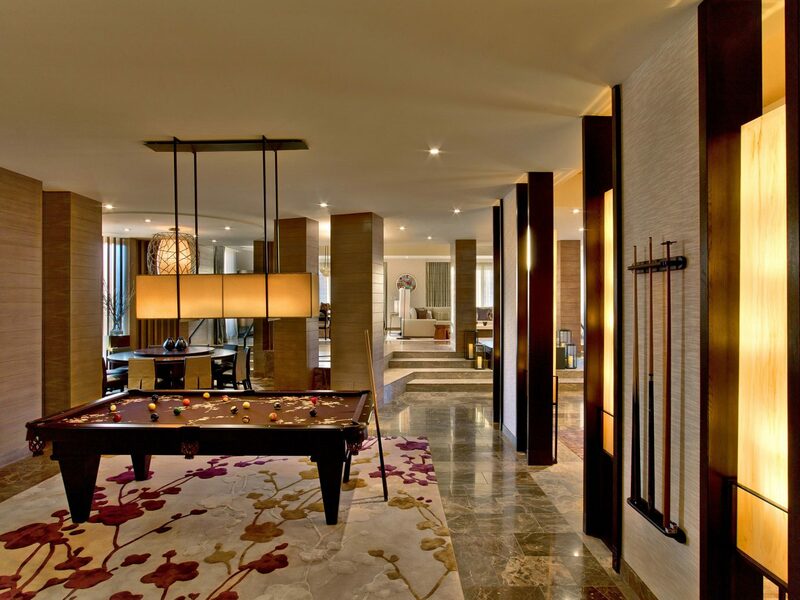 Arriving at one of the Villas at The Mirage, in a secluded hotel wing reached via a gated driveway (or through an unmarked door in the casino) feels like you're returning to your own private mansion, tucked away from the paparazzi. Interiors are lavish—think hues of gold and cream, gilt-framed mirrors, classic portraits, claw-foot nightstands, and low-hanging chandeliers—but you'll probably spend most of your time in the backyard, which is littered with chaise lounges and umbrellas and has its own plunge pool perfect for cooling off from the desert heat (or post-Blackjack nerves). 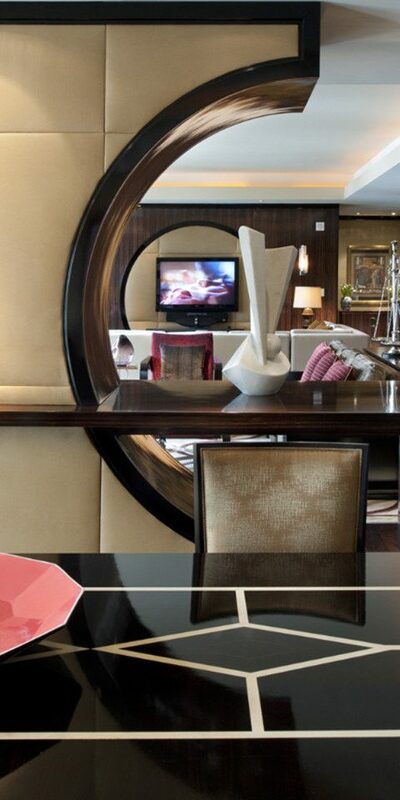 Don't even think about calling room service—your 24-hour personal chef awaits your order.